Frito Lay Good Fun! The Zesty flavor you have known for years, now it has been set onFire! Funyuns Flamin' Hot Onion Flavored Rings deliver the crispy texture and shape of an onion ring with a sizzle that will set your mouth on fire. 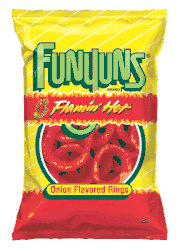 You will love the pleasant flavor onion taste ofthe Funyuns that makes a good contrast to the heat. Funyuns Onion Flavored Rings are a deliciously fun and a different, out of the ordinary snack that you and your family can eat anywhere and enjoy with your favorite foods. Next time you're in the mood for a snack with a kick that's out of the ordinary, try Funyuns Onion Flavored Rings. 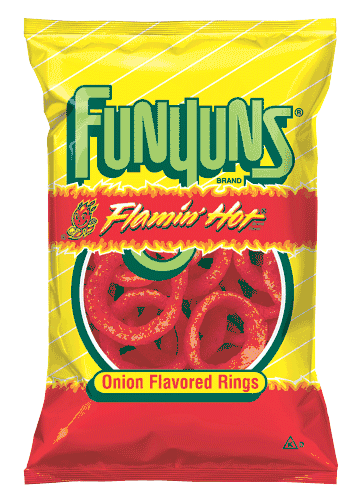 If you can stand the heat Funyuns Flamin� Hot Onion Flaved Rings are great for parties, picnics, barbecues and lunches. Can your mouth handle the fiery taste sensation that runs rings around other snacks? Try a bag of Flamin� Hot Funyuns today and find out! Ingredients:Enriched Corn Meal (Corn Meal, Ferrious Sulfate, Niacin, Thiamin Mononitrate,Riboflavin, and Folic Acid), Vegetable Oil (Corn, Canola, Sunflower, and/or Soybean Oil), Salt and less than 2% of the following: Corn Starch, Corn Flour, Buttermilk, Sugar, Monosodium Glutamate, Yeast Extract, Cheddar Cheese [Milk, Cheese Cultures, Salt, Enzymes], Artificial Color [Red 40 Lake, Yellow 6 Lake], Citric Acid, Whey, Onion Powder, Maltodextrin (Made From Corn), Lactose, Garlic Powder, Natural and Artificial Flavor, Skim Milk, Sodium Diacetate, Gum Arabic, and Extractives of Onion. Rodajas de Cebolla Picantes Funyuns. Frito Lay es buena diversion! El sabor picosito que has conocido por anos, ahora a sido prendido en fuego! Los Funyuns anillos con sabor a cebolla flameantes te traen una deliciosa textura crujiente y la forma redonda de los anillos de cebolla con un chisporroteo que pendrera tu boca con fuego. Te encantara el placentero sabor a cebolla de los Funyuns que hace un buen contraste con el picante. Las Rodajas de Cebolla Picantes Funyuns son una botanadivertida, diferente, y fuera de lo comun que tu familia y tu pueden disfrutar en cualquier parte y junto con tu comida favorita. La proxima vez que tengas antojo de una botana con un toque picosito fuera de lo comun, abre una bolsa delas Rodajas de Cebolla Picantes Funyuns. Si Aguantas el calor de Las Rodajas de Cebolla Picantes Funyuns son fabulosas para disfrutar en picnics, fiestas, barbacoas y almuerzos. Puede tu boca aguanar la ardiente sensacion de Las Rodajas de Cebolla Picantes Funyuns? Te retamos a probarlas! Ingredientes: Harina de Maiz Enriquecida (Harina de Maiz, Sulfato Ferrious, Niacina, Tiamina Mononitrato,Riboflavina y Acido Folico), Aceite Vegetal (Maiz, Canola, Girasol y/o Aceite de Soya), Sal y menos del 2% de los siguientes: Almidon de Maiz, Harina de Maiz, Mantequilla, Azucar, Glutamato Monosodico, Extracto de Levadura, Queso Cheddar [Leche, Cultivos de Queso, Sal, Enzimas], Colorantes Artificiales [Laca Rojo 40, Laca Amarilla 6], Acido Citrico, Suero de Leche, Cebolla en Polvo,Maltodextrina (Hecha de Maiz), Lactosa, Ajo en Polvo, Sabor Natural y Artificial, Leche Descremada, Diacetato de Sodio, Goma Arabica, y Extractivas de Cebolla. What's the problem? Not enough stars. ****** Six stars. This is the snack item that all other snack items should be measured against. I love regular Funyuns. Not just because they're filled with fun, but because they were once one of the most delicious snack products on earth. I walked into a Hess gas station and sitting next the snack-sized bags of Funyuns was something I had never seen: Flamin' Hot Funyuns. There were about a dozen little bags. I bought them all. I never found them again. I would like to thank MexGrocer for providing me with a new source of this delicious corn product and I would like to thank Ray Trinidad for creating this snack. Excuse me I have to go eat some more. ProsCan't get burned by Funyun Flames. These are truly the bomb! The amount of flavoring on the rings is adequate. I have been looking for these in my local store but they have been scarce since folks are buying them up. They even have these in the liquor stores but people buying alcohol are also snapping these up. Thanks for carrying them in the larger bags.